Alex’s Camp Awesome stay was the start of our hosting marathon during July and early August where we had plans to host four separate groups of people in a span of 27 days. Let the craziness begin! Alex got hooked on Lego City Undercover for the WiiU during his last stay with us a few weeks prior. We spent Saturday afternoon playing that after Alex arrived. That evening we went to AirMaxx Trampoline Park in Eden Prairie. This location is new and they were still in the process of building some other attractions. We went during their “adult” time and got the package that included jumping, laser tag, mini-golf, arcade games, pizza and soda. It was A LOT emptier than we were expecting it would be. We played trampoline dodge ball and jumped into their foam pit, played laser tag and “space Egypt” mini-golf (actually themed as Egypt at night), and several rounds of Skeeball. On Sunday we treated Alex to Yoyo Donuts for breakfast and then went to Lake Calhoun for the Aquatennial Beach Bash. We watched a few heats of the milk carton boat races. Apparently the black and white one had already won some races and was slowly taking on water. They won again in the heat that we watched. Because Alex invariably comes to Camp Awesome during the hottest days of the summer, we went to see Pacific Rim to escape the heat of the afternoon. We met Adam downtown for lunch at the food trucks on Monday. Alex and I then spent the afternoon exploring downtown. 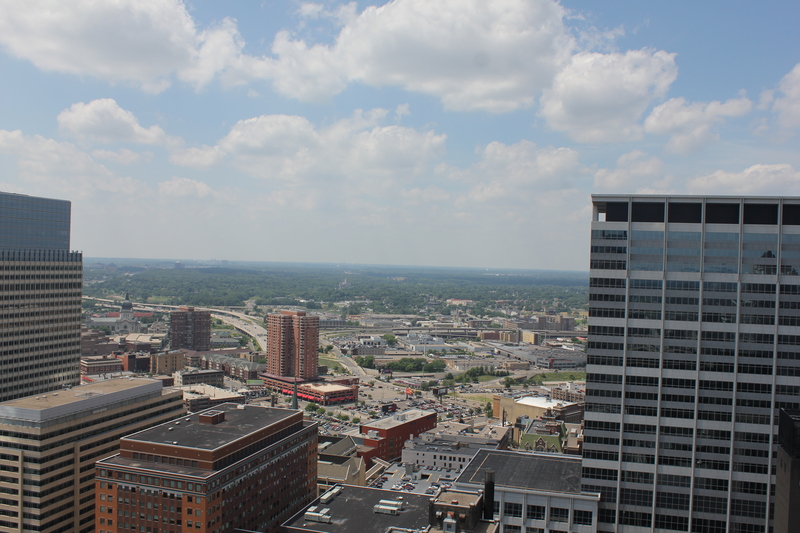 We took a trip to the top of Foshay Tower. They have a small museum about the building and Wilbur Foshay. Despite being one of the shorter skyscrapers in downtown Minneapolis, it still gives a pretty good view of the city. Alex and I were planning to walk to the Mill City Museum, Stone Arch Bridge and the Guthrie, but we opted against that due to the heat. We decided instead to explore Central Library. We spent some time in the automated stacks and perusing over the graphics collections. We met Adam after work and went to Show X at HUGE theater that evening. We also went to Freestyle, the new frozen yogurt shop in our neighborhood, for a snack. Before Alex left on Tuesday, we went stand up paddleboarding on Lake Harriet. It was a little windy which made it difficult to get out to the middle of the lake. I have yet to get a waterproof camera case so sadly there are no pictures of paddleboarding.